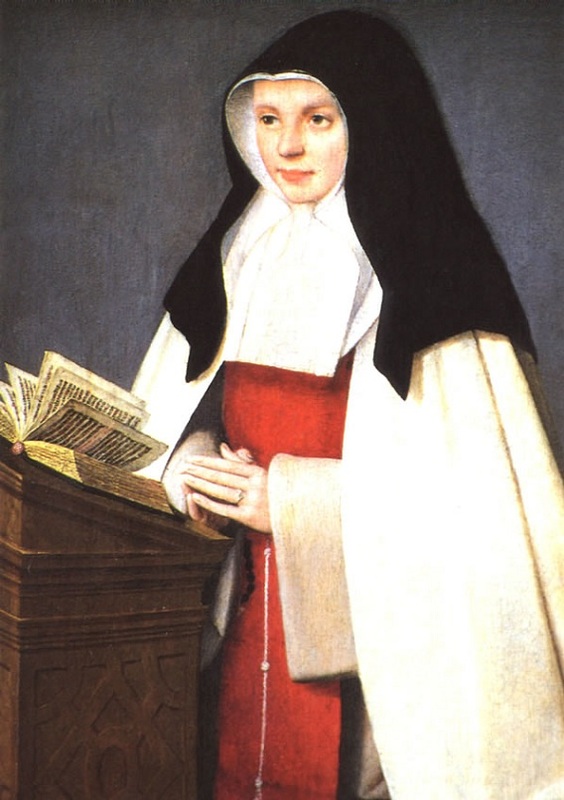 Infinite Art Tournament: Saint of the Month: Saint Jeanne of Valois! Timeframe: April 23, 1464 – February 4, 1505. Credentials: Canonized in 1950 after centuries of general recognition as saint. Martyrdom: None of the painful-death variety. Many sources implicitly or explicitly regard her public humiliations as a kind of martyrdom. Symbolism: Generally portrayed in the habit of the Order of the Annonciades, which she founded. There is consensus on the basic facts of St. Jeanne of Valois’ life, as she was a public figure in relatively recent times. She was a daughter of the Louis XI, King of France, and when she was 12 (some sources say 9) she was married to the Duke of Orléans in the kind of political marriage that the feudal system was always cobbling together. The marriage was forced on the Duke, in fact, and a variety of sources testify that it was an unusually unhappy partnership. Twenty-two years after the wedding, the Duke became Louis XII, King of France. A nasty divorce trial ensued, ending in an annulment that allowed Louis XII to marry Anne of Brittany, the late king’s young widow. St. Jeanne retired to Bourges and founded a Franciscan order, the Annociades, which is still a going concern with six chapter houses. For political purposes of his own, Louis XI compelled Jeanne to marry Louis, Duke of Orléans, his second cousin, and heir presumptive to the throne. After her marriage, the princess suffered even more than before, for the duke hated the wife imposed upon him, and even publicly insulted her in every possible way. She, imagining virtues in her husband that did not exist, loved him tenderly, and when he got into disgrace and was imprisoned exerted herself to mitigate his sufferings and to get him freed. No sooner, however, was the duke, on the death of Charles VIII, raised to the throne of France as Louis XII, than he got his marriage with Jeanne annulled at Rome, on the ground that it was invalid, from lack of consent, and from the fact that it had never been consummated; and the saint's humiliations reached their climax when she found herself, in the face of all France, an unjustly repudiated wife and queen. This is all true, as far as I can tell, except the “heir presumptive” part (Charles VIII came between Louises XI and XII, and the Duke of Orléans was in fact something of an outside bet for the crown at the time of his first marriage). The tone is certainly a bit hard on Louis and his “virtues that did not exist,” and leaves us vulnerable to surprise when we learn that Louis XII was widely considered a highly capable and successful king, who used to be called the “Father of the People” by the French. We are given no context for the divorce and annulment, but this is perhaps to the Encyclopedia’s credit; other sources often imply that Louis was simply pushing over Jeanne in order to hook up with a hot little number half his age. But Anne of Brittany, a capable woman with a mind of her own, was at 22 a twice-married, divorced, widowed woman who had been pretty much continuously pregnant since she was 15 yet had already buried all four of her children. Attractive she may have been, but a sweet young plaything for the new king to dally with she was not. What Anne of Brittany was, was Brittany, in the same sense that Louis XII, as soon as he became the King of France, was France. For those two entities to remain connected and able to hold their own against the other coalescing states of Renaissance Europe, the logic of the feudal system required a personal contract between their leaders. Louis may have been a cad to St. Jeanne – indeed, even his biggest fans concede the point – but there was nothing personal about the humiliations of her divorce. She was merely a victim of statecraft, like all of those far luckier princesses who populate the fairy tales. Louis claimed, with the wealth of physical detail required to sustain his accusation of malformation, that he had been unable to have sexual relations with his wife. This was not only an unpleasant, but an uncertain charge. Jeanne was able to produce evidence to the contrary including witnesses who swore that the king had come in one morning saying, "I have earned, and well earned a drink, for I mounted my wife three or four times during the night." Louis also pleaded that his own performance had been impeded by witchcraft. In that case, answered Jeanne, how was he able to know what it was like to try to make love to her? Well, people are complicated, and it is conceivable that Jeanne of Valois was exuding humility and devoutly hoping for the divorce to go through even as she called witnesses to testify to the frequency of her marital relations. But the way the the St. Jeanne story takes on different textures as you look at it from different angles also serves as a good illustration of something that is perhaps so obvious that it doesn’t need illustrating. That is, that to write hagiography – to talk about a saint in terms of their saintliness – is generally going to mean removing her from the complexity of her context. Saints are meant to be human exemplars, or so I’ve always supposed, but to cast a person as a saint is to focus so much on the simplicity of their virtues, and so little on the inherent messiness of their humanity, as to render them just slightly other than human. It makes them awfully difficult to emulate. *Starting to be suspicious that the old-fashioned scholarship and rhetoric of the Catholic Encyclopedia might be too much of a good thing, I investigated and realized that the version I've been using for the past year is the 1910 edition, which is doubtless available only because it has fallen into the public domain. Amateur hagiography is, alas, something of a pay-to-play proposition, and the good up-to-date resources come with a price tag. ** "The painter Jean Limousin Mazoyer (around 1620-1686) brushed, during a ten-year stay in Bordeaux (1665-1675), a dozen religious paintings, all inspired to varying degrees of classical painting and Franco-Italian (Flemish Raphael, Reni, Poussin, Chardin ...). 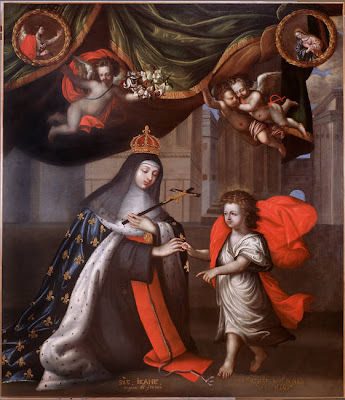 Since many of these works, the Sainte Jeanne de Valois , painted in 1666 for the Annunciation, oscillates between the naive picture of piety (the main group) and paint scholarly (Annunciation medallions angular copied after Philippe de Champaigne )." What did we do before machine translation? This seems, incidentally, to be the entirety of the information about Jean Mazoyer available on the internet. Is an ugly divorce worthy of sainthood? I've been reading up on what qualifies a person for sainthood, and it turns out that the whole concept is very, very fuzzy indeed. A key component, though, is that you need to have a local church community that is consistently advocating for you. In St. Jane's case, my guess -- and only my guess -- would be that she's a saint because she founded a religious order, and therefore created a community with both an emotional and a practical interest in advocating for her sainthood after her death.